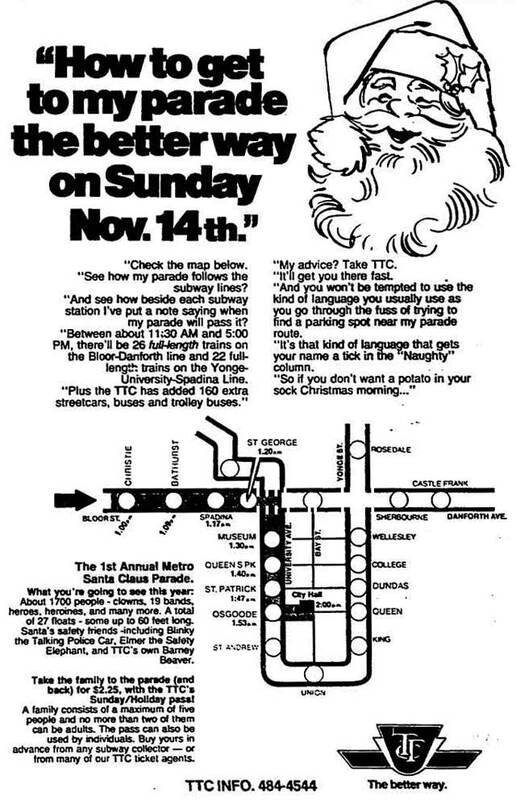 How the seasonal tradition was reborn after Eaton's cancelled it in 1982. Front page, the Toronto Sun, August 10, 1982. Thousands of people will line downtown streets on Sunday to glimpse a visitor from the North Pole. Since 1905, the Santa Claus Parade has entertained generations with its array of floats, marching bands, and upside-down clowns. Yet if businessmen, politicians, and the public hadn’t acted swiftly 30 years ago, the parade would be little more than a nostalgic memory today. 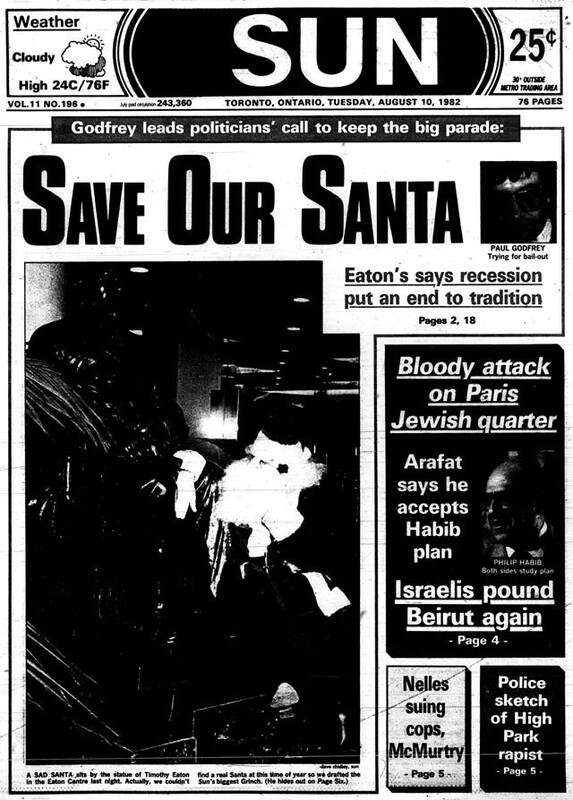 On August 9, 1982, Eaton’s president Frederik Eaton became Toronto’s version of the Grinch when he cancelled the 77-year-old Eaton’s Santa Claus Parade. An economic recession had made footing the $500,000 bill for an event that no longer boosted seasonal sales impractical. 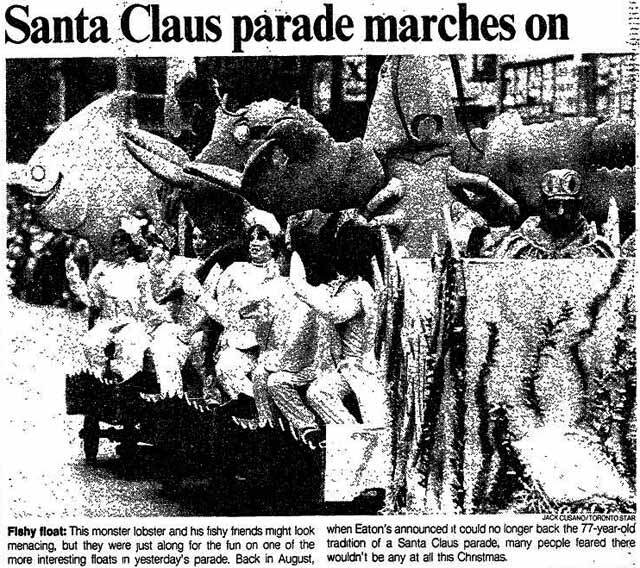 “I’m forty-four years of age, and I remember at least forty Santa Claus parades,” Eaton said. “It has been a long and happy association, and I, with a lot of other people, have enjoyed it immensely. Times are difficult, and it seems silly to be spending money on a parade when we are having to let people go.” (The department store had laid off 500 employees four months earlier.) When the announcement was made, 70 per cent of the preparation work for the parade had already been completed. Source: the Toronto Star, August 13, 1982. Metro Toronto chairman Paul Godfrey was visiting McDonald’s Canada president George Cohon when an aide passed along the news. After a quick meeting with Eaton, Godfrey held a press conference. Wearing a haloed angel on his lapel, Godfrey promised a “110-per cent effort” to save the parade. Torontonians were concerned. “It’s sacrilegious,” one woman told the Sun. “Why do we have to give up all our fantasies? I was hoping I’d be able to take my grandchildren to see it.” In a Star phone poll, 90 per cent of callers supported saving the parade. While the paper set up “yes” and “no” phone lines, the response so overwhelmed the pro-parade line that calls were automatically shifted to the anti-parade number. Not everyone was misty-eyed about the parade’s demise. Alderman John Sewell said he preferred no parade over one held ultra-early again. At the same time, he believed Eaton’s withdrawal might “allow the people of Toronto to organize a better parade” that was less commercialized. Sun columnist Christie Blatchford adopted a “we can’t have nice things” attitude, noting the many complaints Eaton’s endured over an event that was “a gift, a present from a fine Old Toronto family that made its fortune here and felt some obligation and responsibility to the city and its people.” Roman Catholic Archbishop of Toronto Emmett Cardinal Carter, in the guise of a letter from Santa, urged people to direct their energy to helping needy children instead of throwing money at a revived parade. A grassroots “Save Our Santa” campaign attempted to raise money by selling buttons for a dollar. It ran into problems on August 16 when a volunteer dressed as Santa ran afoul of a fundraising bylaw. Undaunted, he wandered into City Hall and received a warm reception from several councillors who happily donned the buttons. Advertisement, the Globe and Mail, November 12, 1982. The same day, Godfrey and Toronto mayor Art Eggleton announced the formation of a non-profit corporation to run the parade, chaired by Cohon and Metro Toronto Zoo chairman Ron Barbaro. Eaton’s transferred the costumes, equipment, and floats to the new corporation. Barbaro and Cohon blitzed potential corporate sponsors, who eventually agreed to pay $25,000 annually for the next three years. Nineteen companies spanning the alphabet from Baskin-Robbins ice cream to discounter Willy Wonderful committed to the parade, as did the provincial government. Barbaro found the response “so unbelievable” that some potential sponsors were turned down, lest the parade be overrun with floats. The first stretch to University Avenue was a breeze. I skipped back and forth between the rows of spectators, shook endless lines of hopeful hands, sparred with a few who pulled my tail and tried to dodge a rather intimidating block of baton twirlers. By University Avenue, my black furry boots had spanking new holes in the bottom and my meowed greetings were raspier and fewer. The crowd was about four lines deep and a sea of mittens waved. There were a few tears when some missed my exhausted paw. Source: the Toronto Star, November 15, 1982. The low point of the day occurred off the parade route. Some spectators found their trip home disrupted by the aftermath of a shooting that wounded four, at a protest in front of the Indian consulate general office at Bloor and Yonge streets. Additional material from The Eatons by Rod McQueen (Toronto: Stoddart, 1999) and the following newspapers: the August 10, 1982 and August 17, 1982 editions of the Globe and Mail, the August 10, 1982, August 11, 1982, August 14, 1982, August 18, 1982, August 20, 1982, and November 15, 1982 editions of the Toronto Star, and the August 10, 1982, August 11, 1982, and November 15, 1982 editions of the Toronto Sun.